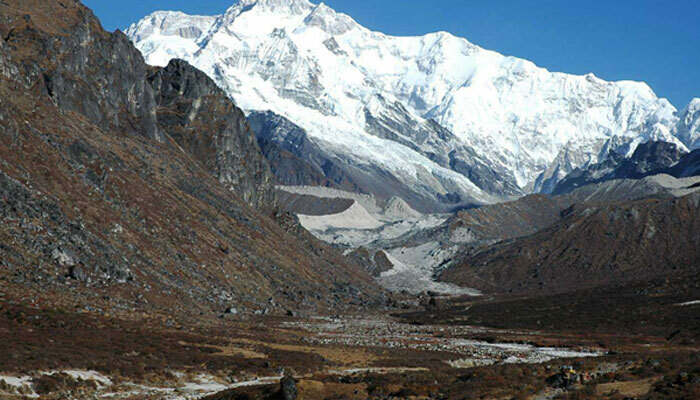 Goechala Trek is one of the finest Proper High Altitude Trekking destinations of Sikkim - India. During Goechala Trek one will be able to reach the closest point to the third Highest Mountain of the world - Mt. Kanchendzonga 8586m.along with the pristine views of several other Snow Capped Towering Peaks and Valleys. The Highest Point one reaches during this Trek is 4940m to 5000m and the highest point one sleeps at is Around 4200m. During Goechala trek one will be able to see the panoramic and pristine view of the 16 snow capped towering mountains peaks from Dzongri View point which includes - Mt. Kanchendzonga 8585m, Mt. Kumbukarna 7710m, Mt. Kabur (N) 7338M, Mt. Kabur (S) 7317m, Mt. Simvo 6811m, Mt. Sinolchu 6687m, Mt. Pandim 6691m, Mt. Rathong 6679m, Mt. Kokthang 6147m, Mt. Tenzingkhang 6010m, Mt. Kabru Forked 6008m, Mt. Jopuno 5936m, Mt. Frey Peak 5830m, Mt. Narsing 5825m, Mt. Khanglakhang 5560m, Mt. Goecha Peak 5127m...Apart from this one will be able to see the 360 degree view of the mountains peaks and hills...From Goechala view point one will be able to see the pristine and closest view of the mighty Mt. Kanchendzonga and few of its neighbouring peaks. Arrival at Bagdoghra Airport, drive of 5 – 6 Hrs towards Yuksom. Arrival at Yuksom,is a first capital of sikkim and is also a base camp and last civilization area before starting Goechala Trek. It is also a base camp to many Mountain Expedition and peak climbing in sikkim. It is located at an Altitude of 1875m above seas level. O/N Yuksom at hotel. Today after breakfast we continue to walk uphill Trek through the properly maintained trail till one reaches Phedang – A small clearing in the middle of the pristine Rhododendron Forest with excellent views of the Kanchenjunga range of mountains. One can have a spectacular and pristine view of the Panoramic Mountain Views from the Phedang Camp site itself. This Camp site is one of the most important location for proper Acclimatization before reaching 4000 + meters and is good for one night camping. O/N Camping. Today we continue our uphill journey through temperate to Alpine forest till we reaches Dzongri Camp site. A 40 min steep walk, as we reach the ridge's top, Deorali Dara or Windy hillfrom where one gets the awesome views of the Mountains and its peaks. A nice leisurely hour walk through the smaller rhododendron trees and juniper bushes before we reach Dzongri. O/N Camping. Day 05: Dzongri – Acclimatization day. Rest day for acclimatization. Rise early at dawn, a 30-40 mins steep hike amidst thin air to Dabla Gang (Dzongri-la OR view point) to view the sunrise on Kangchenjunga and the neighbouring peaks; Rathong 6683m; Kokthang 6150m; Kabru Dome 6604m and Forked Peak 6116m. Return to camp for breakfast. Free to explore, Day hike to Laxmi Pokhari or take a walk toward the Black peak for acclimatization from where we can see Frey's peak and the Rathong valley. Return to camp site. O/N camping. The day's walk starts with a short climb to a ridge followed by a rapid steep descend of 100m to Kockchurung and Prek river. Continue crossing some boulders and climb gently to the campsite of Thangsing for our lunch with view of Mt. Pandim and Mt. Kanchenjunga. O/N camping. A gentle 2-3 hrs walk to camp at Lamune. While the camp is set up, we take a walk to Samiti Lake, 4453m with Kanchenjunga looming ahead of us. The trail goes past stunted rhododendron bushes, azaleas and past a prayer wall before ascending a moraine path to a ridge from where you can look down at Samiti Pokhari (4200m) a beautiful and sacred lake surrounded by snow capped peaks Mt. Kanchandzonga, Mt. Pandim and Mt. Thenchinkhang. Return to camp for lunch. O/N camping. Early morning excursion to Goechala (pass), one walk along the moraine path by the side of Samiti lake to view the east face of Mt. Kanchendzonga bathed in the rays of the early sun. We cross the ½ km sandy plain known as Zemathang, footprints of Bluesheeps and other animals are common sighting. After 2 hours, we arrive at the 1st view point of Goechala and walk further 2 hours to 2nd view point to enjoy the close up views of Mt. Kanchendzonga 8534m. Return to camp for late lunch and later walk to Thangshing campsite. O/N camping. After breakfast, trek back the same trail till Kockchurung, from where we take another trail via Phedang to Tshoka. Hot lunch at Phedang and continue to walk to Tshoka. O/N Hut. After breakfast trek back to Yuksom (4 to 5 hours). O/N Hotel. Early morning after breakfast leave for Bagdoghra airport back. Drive of 5 - 6 Hrs. Journey Ends by dropping at Bagdoghra Airport. To & Fro Bagdoghra Airport to Yuksom by Non A/C Innova with 5 / 6 passenger per vehicle. Accommodation on twin sharing basis at Lodge / Homestay / Tent. Local Trekking Guide + Cook for Trekking period only. Supporting staff for Trekking & Yak / Pony for Luggage. Trekking Permits & Permission, Environmental fees. Domestic Trekking Insurance for Indian Nationals only. 25% (Non refundable) of trek amount Advance for confirmation.